You are welcome to join an historic endeavour to establish a coherence creating group in Brussels. The Maharishi Invincibility Center lies a few footsteps away from the main institutions of the European Union. The past years, we have seen over and over again that groups of Yogic Flyers have an influence of harmony on the highest political decision making process. Furthermore, lobbyists regard Brussels as the second most important global political hub after Washington D.C. Also NATO and the largest diplomatic corps in the world with 5.000 diplomats are present. 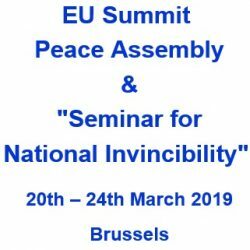 Therefore, a permanent coherence creating group is very important and we want to have 108 Yogic Flyers as this is the square root of 1% of the population of Brussels. In the European quarter surrounding the area of the Maharishi Invincibility Center, about 90.000 people are living. 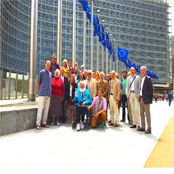 30 Yogic Flyers can have an effect of harmony on this core group of the EU administrative centers. Enjoy long group programmes and beautiful Maharishi tapes in the silent, profound atmosphere of our Maharishi Invincibility Centre, oriented perfectly to the east and functioning for ten years as the silent core of Europe in the heart of Brussels. There are many beautiful parks in the area for refreshing Walk and Talks. Enjoy long group programmes and beautiful Maharishi tapes in the silent, profound atmosphere of our Maharishi Invincibility Centre, oriented perfectly to the east, and functioning for ten years as the silent core of Europe in the heart of Brussels. There are many beautiful parks in the area for refreshing walk and talks. If you would like to participate in this historic endeavour, you can contact us at: brussels@maharishi.net. Brussels 108 provides a very profound rounding program while at the same time providing an opportunity to enjoy one of Europe’s most interesting cities. I met wonderful people from all over Europe and Stijn took care of every detail to make everyone’s stay comfortable. I highly recommend it to anyone who has a week or more to spend in Europe. 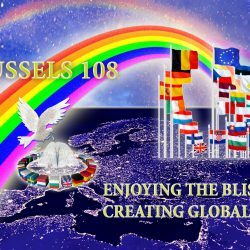 Being a part of Brussels 108 in September and October 2016 was a most powerful experience. Every day was a new revelation of new levels of bliss. It was more explicitly seen after some time when I came back home.